Thanks to a certain TV show and endless appearances on the silver screen, Beverly Hills may very well possess the most famous zip code in the U.S. Although it only spans 5.7 square miles, this little city is a world-class destination, attracting millions of visitors each year who are hoping to take some of its glitz and glamour home with them. Beverly Hills is located in the western region of Los Angeles County, and it's surrounded by the cities of Los Angeles, West Hollywood, Santa Monica and Culver City. It is said to form a "Platinum Triangle" with adjacent neighborhoods Bel Air and Holmby Hills, as all three areas are regarded as the most affluent within Los Angeles. Beverly Hills is home to many A-list celebrities, public figures, executives and well-to-do families and individuals who are able to afford homes in this astronomically priced area. 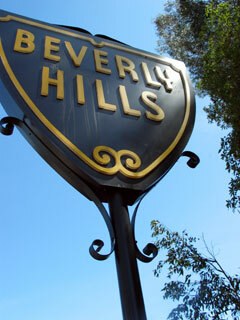 Visitors from around the world frequent Beverly Hills in droves, searching for stars and frequenting its chichi stores, boutiques and eateries. Living up to its illustrious reputation, you'll find an exceptional selection of five-star hotels in Beverly Hills. Among the most notable are The Beverly Hills Hotel and Bungalows, The Beverly Hilton, The Beverly Wilshire, L'Ermitage Beverly Hills, Montage Beverly Hills, The Peninsula Beverly Hills and Thompson Beverly Hills. The sky's the limit at these impressive properties, but, as with most places in this city, they will cost guests a pretty penny.